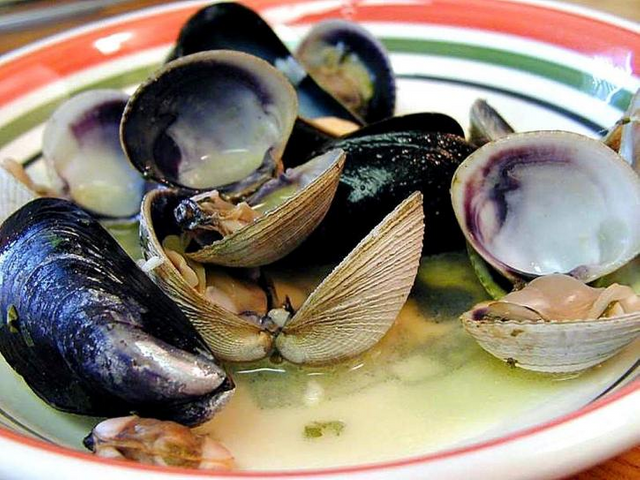 Clams, like all galicia meals (especially seafood), it's very tasty! It is also a very easy and quick recipe to make, which has few ingredients. In addition, it is very tasty, which has an unbeatable satisfaction / effort ratio. It also has few ingredients. Let's see how to make some clams in the marinera. 1.- In a saucepan, toss the olive oil and chopped garlic. Sauté the garlic over medium heat, until it has browned a little. 2.- When the garlic begins to take color, add the flour and well integrate all the ingredients with a wooden spoon. Let saute a couple of minutes, so that the flour is cooked well and then it does not taste like raw. 3.- We pour a splash of white wine and integrate and stir well again with the rest of the ingredients. Let there be no lumps. There should be a rather liquid sauce, but not too much because the clams will release some water. 4.- After another two minutes, when the wine has been well integrated and its alcohol has evaporated, we toss the clams and the chopped parsley very fine. We cook until the clams open. Finally, if necessary, we rectify the salt (the clams already have a lot of salt). You got a 28.41% upvote from @luckyvotes courtesy of @punjolife! You got a 23.54% upvote from @moneymatchgaming courtesy of @punjolife! Please consider upvoting this post to help support the MMG Competitive Gaming Community.